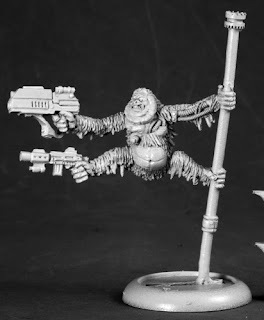 I saw mention of this mini over on the All Things Fett blog, so forgive me copying your post, but this was too perfect for Simian Saturday and my love of Post Apocalyptic Mutant Animals to not post about! 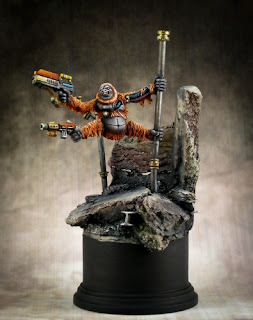 Check out Orangutango! 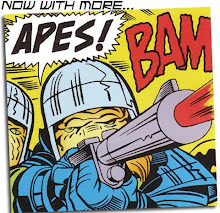 A cybered up Orangutan firing a pair of laser pistols! Woo Hoo! 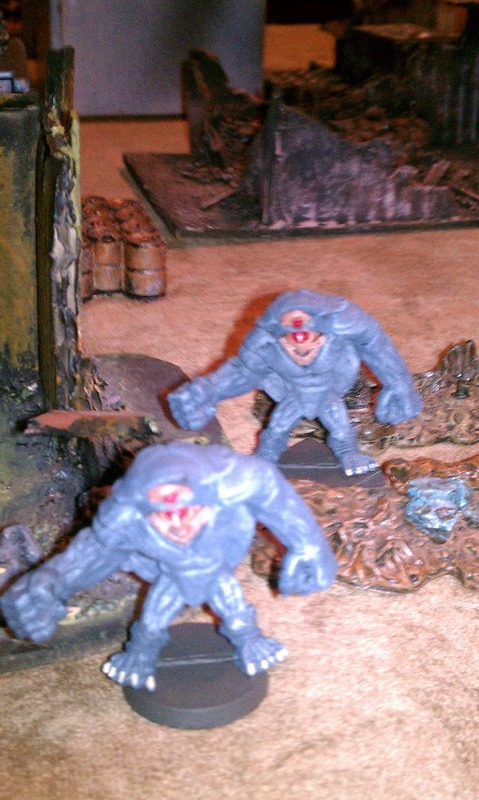 This is a 28mm from the Reaper Miniatures, Chronoscope line, which is a great line for sci fi 28mm miniatures! Hope they do more like this!!! Now off to place my order!!! I've been on a Sci Fi kick of late, Mutant Future is great but I'd like to play something a bit more Space Operaish at some point. I've been looking at a bunch of different systems, picking up rules here and there in PDF, but being a book in hand (Dead Tree) kinda grognard I tend to order print products if the pdf looks good to me. I'm working around computers all day at work so I prefer to read a book the old fashioned way when I get home. Just weird that way I guess. Anyways having not finalized the RPG system which I hope to use at some point (although Stars Without Number is high on my list), I've been looking at gaming resources that can be used with multiple systems. 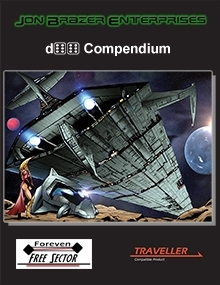 I recently came across Jon Brazer Enterprises d66 Compendium, it is a supplement of various tables to help "fill out" one's sci fi campaigns. It is designed for Traveller but I see no problems using it for whatever Sci Fi setting your using. The Starship Arkham made its final approach to the planet Zelos, skirting past the dozens of antique communication satellites locked in orbit around the world. Contact was made with Bayoone Starport far below, their contact would get them past the prying eyes of the Theocrats that would surely frown upon the Arkham's illegal cargo of Solomani Hemp! 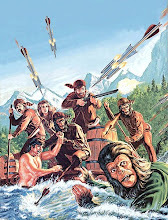 Captain Noah wolfed down his bowl of Pink Curry Rice in the galley, the Zelosians had bizarre laws about meals and eating and he didn't want to deal with the locals on an empty stomach. Noah made his way to the bridge, moving quickly he was long accustomed to the dim interior lighting on the ship, a design flaw that he'd never bothered to have fixed. What he wasn't accustomed to was the dead fish smell that permeated the ship's corridors, a more recent "addition" to the ship, a hold over from their last passenger "ambassadress" Hekenu and her entourage, Noah disliked most aliens, but did his best to hide his prejudices. That would be bad for business, but their fishy smell just refused to go away. After this run he'd have to have the whole ship's interior flash scrubbed just to get rid of the stench. He should have made them wear vacc suits the whole time. Imad their contact appeared on the comm screen, giving the landing coordinates, that would hopefully allow them to avoid the eyes and ears of the Theocrats. Noah gave a slight smirk, eyeing the elephants in the background of Imad's screen, on Zelos all starport goods must be transported via pachyderm. Another of the Theocrats bizarre laws. Noah checked to make sure his trusty blaster,"Vera" was fully charged and prepared to land. 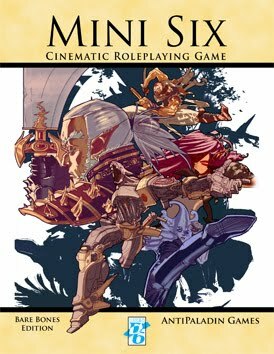 Awhile back I talked about the Mini-Six RPG. I recently ordered the print copy of the rules, $8 bucks including shipping is an awesome deal! If your a fan of the d6 (Original Star Wars RPG System) or have even a passing interest in the d6 system you need to check this out! The PDF is free, so what are you waiting for?? blog. 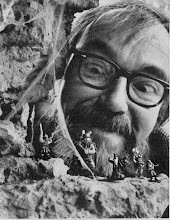 He's been doing a ton of 70's Horror Comic conversions for the d6 system (based on the old Nightlife RPG). Check 'em out! Dropped by the Friendly Neighborhood Comic Shop today, I haven't been there in ages due to my new job's demands, so I was curious to see what new goodies they had gotten in. The shop also has a gaming section, so I was hoping maybe they had gotten in the recently released Armageddon Unlimited for Heroes Unlimited but sadly it wasn't in yet. While digging in the bargain bin, I found the Trade Paperback of Volume 1 of X-Men 2099! I've picked up some issues here and there over the years, but I only have a few, so I was excited to find this, especially for 50% off! Here's the blurb about the series," Xi'an Chi Xan wants Meanstreak, Krystalin, Skullfire, and the rest to help rebuild Professor X's dream, but lies, betrayal, and assassination may tear them down before they've started. With the gods of the Aesir and demons from the Theatre of Pain... "
Good stuff! 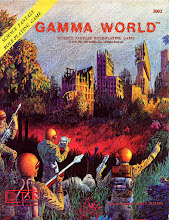 I can loot some ideas from this for my Mutant Future Campaign or Heroes Unlimited or both! 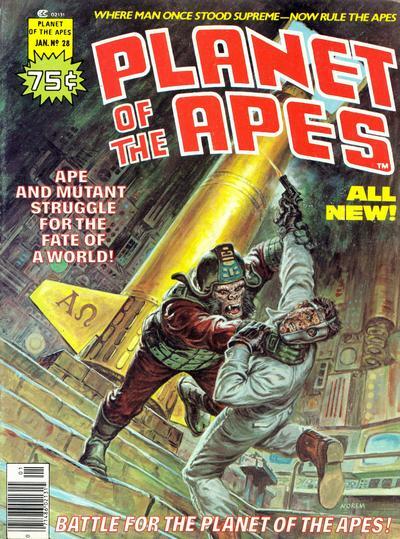 The classic POTA movies and comics are a great resource for your Mutant Future campaigns. 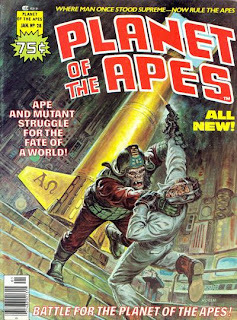 Apes vs. Mutant Radioactivists! Sure its been done before but it works!! Well I have finally completed my Dragonstar collection. I was missing the Smuggler's Run module/accessory. Found it for 3 bucks, couldn't pass it up for that price. While it is 3.0 edition, I still have fond memories of the Setting and wanted to have the complete run of books that they did for it. 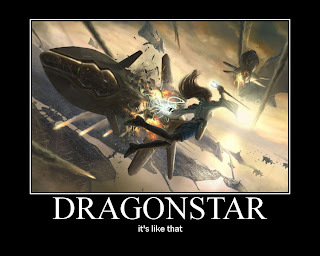 All I am missing now are the Living Dragonstar Adventures that they did for the short lived Living Dragonstar Campaign, I haven't been able to find those anywhere. But I at least have all of the official published books and adventures. "Take Your Adventure to the Stars. At the edge of civilized space or in the shadow of the Dragon Empire itself, the citizens of the galaxy need foodstuffs, technology, clothing, and contraband. This is the role of the intergalactic free trader, delivering important, secret, or illegal cargo to the richest spires of the Empire and the deepest pits of the Outlands. It's a career full of tough choices, bad breaks, and risk, but it's yours. 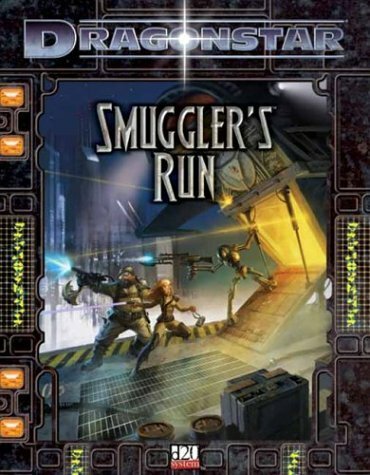 Smuggler's Run has everything you need to a play smuggler or free trader player character in the Dragonstar campaign setting, plus the tools players and DMs both need to make a privateer's campaign fun and easy. New prestige classes, new feats, new spells, and new starships expand and define the markets of the Dragon Empire. Simple new rules for commerce, supply, and demand focus the smuggler's business on its exciting choices and adventure possibilities. 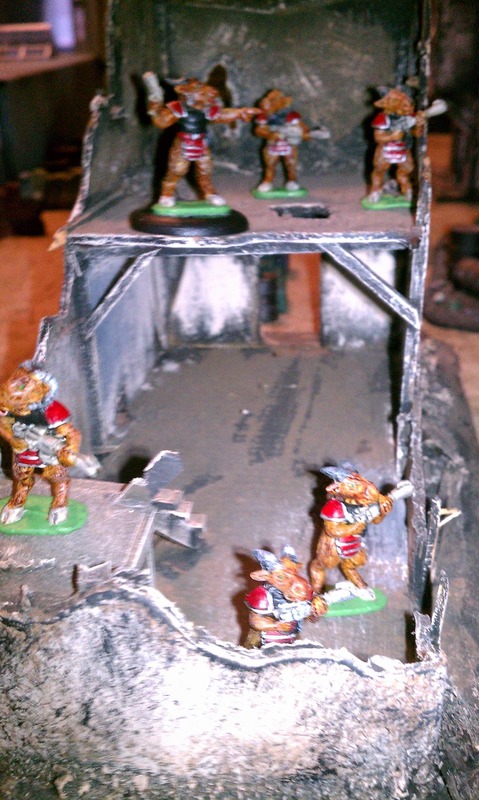 To demonstrate it all, this book describes a new, remote corner of the Dragonstar universe that's easy to place into any campaign: the Smuggler's Run." Yesterday I posted a bit about this free Microlite 20 Star Trek TOS RPG. I've since had time to read it some more. I must admit I quite like it! My buddy Eli has even worked up a character sheet for it. 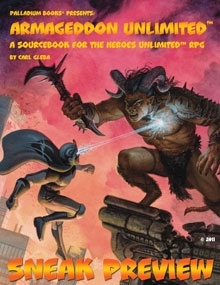 I'm thinking it would at minimum be a sweet con game, I can see even using some stuff from the awesome Stars Without Number RPG with it, especially the GM Tools/Templates section. I know I've complained about the Palladium System and in particular Rifts in the past, but I've always had a soft spot for Heroes Unlimited. 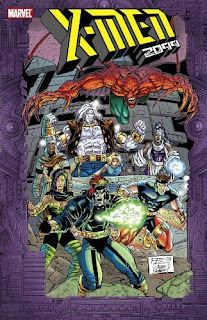 While I got rid of most of my Rifts/Palladium Books, I held on to all of my Heroes Unlimited books and my After the Bomb/TMNT books. Anyways, don't tell my current players but I've actually "looted" powers and super abilities from some of the Heroes Unlimited Sourcebooks I own for our current Mutant Future Campaign. 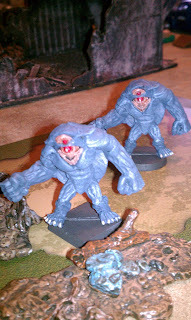 Great way to make a particular NPC or Mutant beast particularly unique and nasty. Don't go overboard though, the powers in HU are NOT scaled to work with MF, you can quickly wind up with something that can utterly trash your party if your not careful, but with some tweaks they are workable. In particular the mutant appearance random table section in the core HU rulebook can help you come up with some unusual appearing mutants. Something I prefer in my games. This brings me to an upcoming release for Heroes Unlimited, I don't think we've seen a true release for HU in awhile. Palladium has been kind enough to provide a free teaser preview for this one (pretty cool for them to do that I think, I wish more companies would do this). You can check out Armageddon Unlimited here. 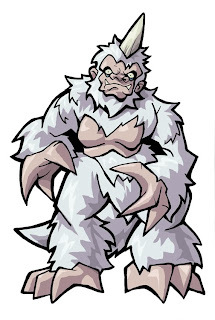 I found this cool picture of a Mugato along with a ton of Star Trek Paper Minis/Standies over here. If your wanting to do Star Trek minis on a budget or can't find any suitable metal Star Trek Minis, this is the place to look. You might also want to take a look at the FREE microlite 20 rules Where No Man Has Gone Before game set during the TOS era of Star Trek. 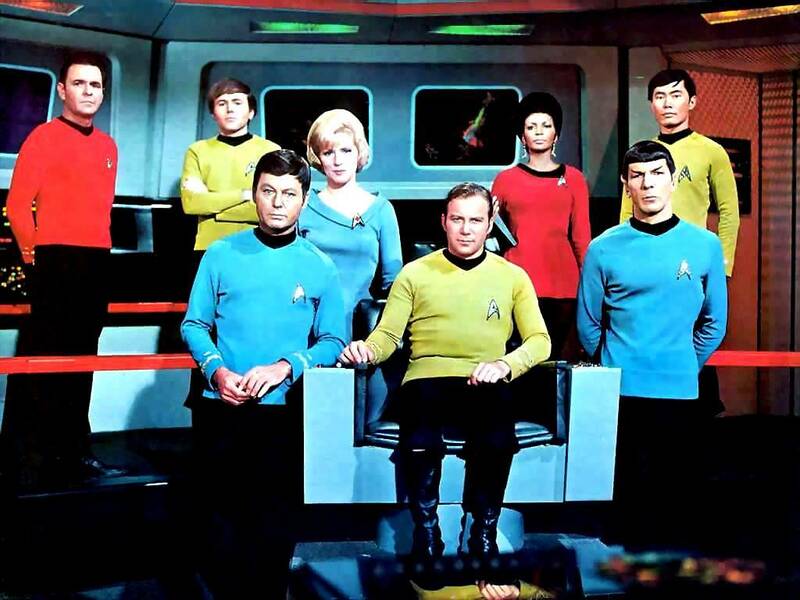 Star Trek TOS has always had a special place in my Geek Heart! Big Trouble at Moldy Niche! The Goatlords have made a move into the ruins near the community of Moldy Niche. The Slough Elves have called in their Mirelurk Allies, or maybe the mutant crustaceans were just hungry! Should be one heck of a fight! I posted recently that I had ordered this book from Lulu, well I'm happy to say it arrived yesterday. I haven't had time to sit and read it cover to cover, but what I have skimmed, I very much enjoy. This is a great resource for Labyrinth Lord, and I will definately be using stuff from it for my Mutant Future Campaign. 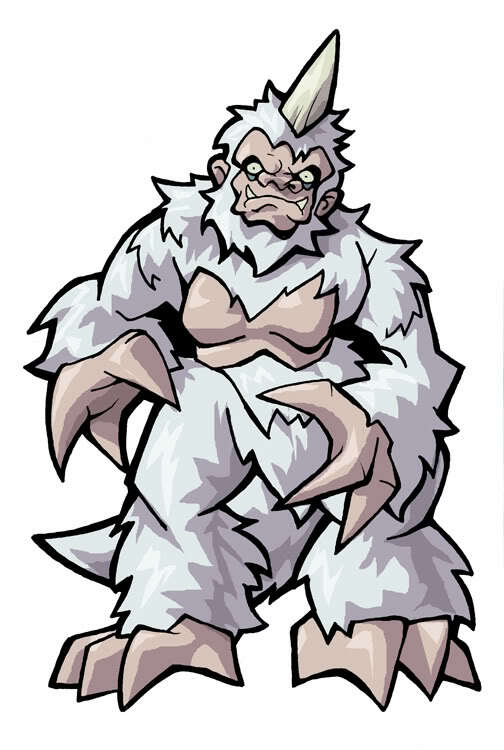 I'm quite pleased to see two simian based PC races, the White Apes and the White Ape Hybrids! 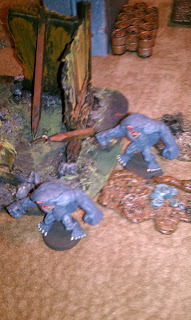 The Cthulhu stuff is great, reminds me of the Cthulhu Mythos stuff that was in my original Deities & Demigods from back in the day (still have it by the way, woo hoo!). I hope to read more of RoCC later today, but if you've been on the fence about picking this one up I encourage you to do so! Goblinoid Games just keeps knocking it out of the ball park! Found this on the net, thought it fit nicely with my recent posts about Dragonstar. I always liked the grim and gritty look of Alex Ross's Earth X Captain America. Weapons & Equipment: Tattered American Flag, Red Boots (old and worn), Shield (Indestructable) can be thrown for 2d6 damage +5. Other skills/abilities : Highly skilled tactician and leader, skilled with using the shield in combat (+4 to hit), with a successful dexterity check he can throw the shield in such a way that after hitting its target it will return to him. Also with a successful dexterity check he can parry (as long as he still has an available action) energy blasts with his shield that would have otherwise struck him. He wanders the wastelands, protecting the weak and the innocent, but he never lingers for long in any one place. Tales of him go back for at least a century yet he doesn't seem to have aged. Many wonder about his story, who is he, why does he bear the emblem of a forgotten age. His body is covered in scars of all sorts, yet one in particular is most striking, he bears the scar of an "A", apparently carved into his forehead in the distant past. 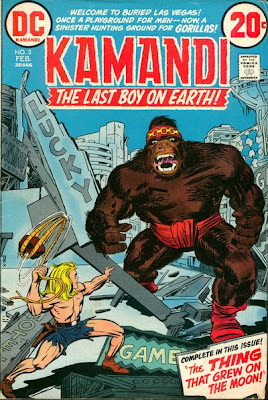 He says little, while he appears to be human; his strength, stamina and dexterity are the peak of the human condition, some would say super human. About him lies an aura of sadness, when he looks around him, his eyes have a distant look about them as if he sees things the way they used to be, but that's impossible…isn't it? 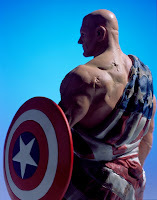 Based on the Alex Ross Earth X version of the Marvel Comics character Captain America, no copyright infringement is intended.